I’ve always wanted to visit Yellowstone in winter to photograph the scenery and wildlife. After considerable internet searching, this year I signed on for a February trip with National Geographic contributing photographer Daniel J. Cox (Natural Exposures). The trip schedule included four day-long excursions by snow coach into the park from West Yellowstone and a day on either end to travel from/to Bozeman. Since I was going to travel to Montana, I added on three days of photographing the park from north entrance at Mammoth Hot Springs, the only area of the park that clears the roads for automobile travel during the winter. More about my independent travels in Part 2. Part 1 is long and includes both my trip report and a review of the Natural Exposures Yellowstone in Winter Photo Tour for those considering this trip or this tour company. Booking the trip was easy with terrific communications from Tanya Cox, Daniel’s wife. She arranged for hotel accommodations in Bozeman for the night before the trip, and offered a discount of $100 for being a first-time traveler with Natural Exposures. I was also able to book the trip without the lodging costs since I had Holiday Inn points I could use for free lodging. The afternoon drive to West Yellowstone was a little over two hours, and we stopped to photograph big horn sheep on a hill by the road. That evening we met to discuss the upcoming trips into the park, photographic considerations for snow and high contrast, and Dan showed some of his work. We also filled in menu selections for the box lunches that Tanya would prepare for us. There was a group dinner in the hotel restaurant following the presentation. Natural Exposures uses 28 passenger tour vehicles (snow yacht, which have been designed for travel on snow in winter as well as on the road pavement the rest of the year. With only 14 participants, we each had two seats so we had plenty of room for our gear. We headed out from the hotel at 7 AM in anticipation of some delay at the park entrance station, which didn’t happen, and we arrived at the Madison River in low light conditions due to the heavy overcast. We stopped near several groups of tundra swans and stayed there while the light brightened. It was an excellent opportunity as we had adults and signets, preening behavior, take-offs, fly-bys, and landings. Moving down the road, which follows the river, we stopped to photograph elk, bison, and eagles. We stopped for a hot drink and pastry break at Madison Junction, which also has a warming hut and heated restrooms. Heading south from here, we drove along Firehole Canyon Drive, stopping to photograph the cascades and walk along the road for other scenic views of the river. Lower Geyser Basin is a short drive from Firehole Canyon and we stopped here for an hour to explore the Fountain Paint Pots and other thermal features along the boardwalk trail. It’s very difficult to get still photos that fully capture the dynamics of thermal features. Luckily, I didn’t forget that I have video capture capability on my Canon cameras, and actually remembered to use it once in a while. The return to West Yellowstone included stops whenever bison, elk, and eagles offered the opportunities. As we neared Madison Junction we received a report that a bobcat was on the prowl along the river. Dan mentioned that he had heard of the bobcat for the last three years but had never seen it. By the time we found the bobcat, it was getting pretty dark and snowing, but we couldn’t pass up this opportunity. It snowed overnight and we weren’t disappointed with the snow covered bison we found along the Madison River as well as snow covered trees and a fresh layer of snow everywhere. It continued to snow on-and-off through the morning and we did have blue skies at times later in the day. We spent a long time with an eagle perched in a tree across the river and we followed it as it moved up the river. It was likely the same eagle we photographed the day before in the same tree. Great looks for a long time. Once again we stopped at Madison Junction for the facilities and a snack break. Today we turned north and stopped for a while at Gibbon Falls. The parking area and paths had been renovated in the recent road upgrades and while there were railings to protect visitors from falling into the canyon, they were of little benefit as the snow was packed down and three feet deep. Only the top of the railing and stone walls showed. The demarcation of packed snow to loose snow was impossible to determine in many locations and stepping out too far from the vehicle tracks could result in being hip deep in snow, as several of us found out. Gibbon Falls was an interesting place to photograph with distant and close views available to those who decided to walk down the road, and back uphill. The Norris Geyser Basin offered two trails to follow, one short and the other longer with an elevation change. We only had an hour here so I chose to follow the short path figuring I’d have more time to photograph whatever interested me. One difficulty with the paths here are that the number of visitors is probably less than some of the other spots and the deep snow on the boardwalks are only packed down in the very center. Letting someone pass was an interesting exercise. One feature here is that small pine trees are bent over with the weight of accumulating snow next to thermal vents and pools that have no snow accumulation at all. We made a few stops along the way back to West Yellowstone for scenics and a particularly well lit bison foraging near the road. 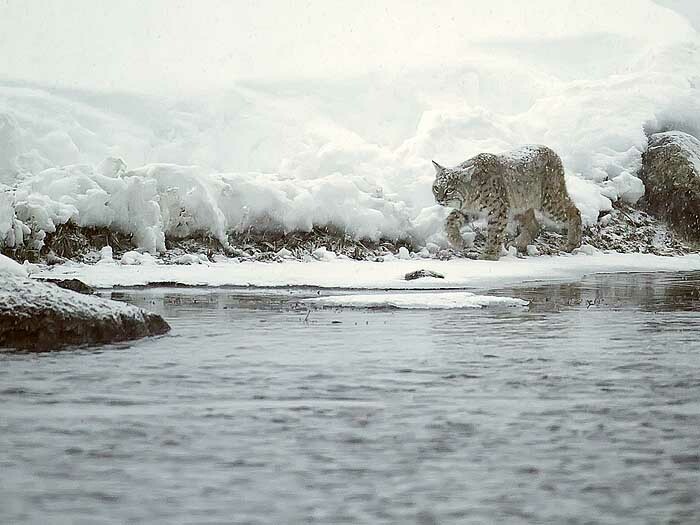 As we neared Madison Junction, we again received a report of the bobcat hunting along the river. This time the light was still low but at least it wasn’t snowing; the action was limited as the cat stayed in one location, watching, napping, grooming. No waterfowl floated by, which could have been exciting. It would have been a toss-up of who was more excited, the birds or the photographers. The temperature was colder than previous days, about 0º Fahrenheit to start the day. While this sounds bad it was indeed a good thing. The cold atmosphere in combination with moist air results in anything nearby being frosted. We weren’t disappointed; frosted trees, frosted bison, steam rising from the rivers, we had it all. Trees near the river were frosted from the steam rising from the water and the steam added some interest to the scene, but it was a challenge to capture images of wildlife near the river shooting through the mist. A breeze was blowing the steam by one bison, and by watching and waiting I did get some images with less steam between me and the animal, resulting in images that show the effect of the steam on the bison in this cold environment. Another effect of moist air on cold fur occurs with bison breath frosting their faces. We were fortunate to arrive at the thermal areas near Fountain Flats while the frost was still on the trees; on the return trip from Old Faithful all the frost had melted. Near Midway Geyser Basin we had good views of bison on both sides of the Firehole River. The time at Old Faithful in the Upper Geyser Basin was limited to a little more than an hour due to all the stops for wildlife we made on the way. Just barely enough time to get to a few nearby thermal features. 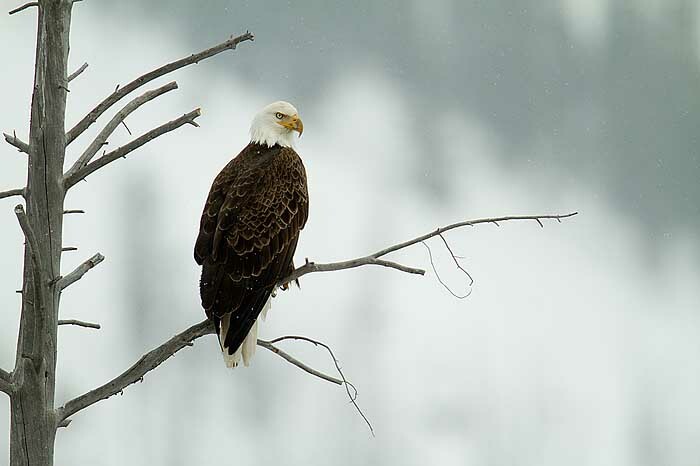 Along the way back to West Yellowstone we stopped to photograph an eagle flying over the river, watching the ducks, hoping for a dynamic moment that never came. The eagle perched on the top of a pine tree for a while, but by the time I had retrieved my big lens from the bus, it had flown off. Today we switched to two small vans since the snow “yacht” didn’t have the legs to reach the canyon and return on a single tank of fuel. The smaller vehicles had similar accommodations as the larger vehicle with two seats for each photographer. We headed out along the Madison River with a forecast of snow for the day. It did snow at first, but we were treated to breaks in the snow, with some blue sky. We stopped for scenery and elk along the river until out morning break at Madison Junction. The rest stop was crowded with buses, vans, snow coaches, and snowmobiles. On previous days the rest stop had only one or two vehicles; we had stopped frequently to photograph along the Madison River and reached the rest stop well after the normal vehicle tour schedule. From here we headed to Norris where we turned west towards Canyon. It also started snowing heavily. We ate our box lunches at the visitor center which had a large room with picnic tables. On previous days we ate in the bus, either at a rest stop or while we were traveling to save time. As we headed over to the scenic overlooks of Grand Canyon of the Yellowstone, it continued to snow heavily. Not looking good as we stopped to photograph the Yellowstone River from a bridge. As luck would have it, the snow stopped when we arrived at the overlook of the Lower Falls, a 306 foot drop with water thundering over into the canyon bottom. Ice formations on either side of the falls were conspicuous even from such a great distance. We also stopped at Upper Falls, and then headed to Hayden Valley in hopes of seeing wildlife. It was quiet there, with a couple of bison in the middle of the valley a mile or so away. They were mighty small in the viewfinder. The drive back to West Yellowstone seemed long, and it I’m certain it would have seemed longer if I had to drive; the snow was very heavy and it was difficult to see the road. Traffic wasn’t much of a problem, but if one were to veer off the road slightly, the unpacked sides would cause a problem for the vehicle. (More on that in Part 2.) After we arrived at the hotel, we met for a pizza supper and many participants provided images to share with the group. Dan also showed videos of their Canadian Rockies trip and an Africa trip (these and others can be viewed on the Natural Exposures website). The next morning we headed back to Bozeman to catch flights home, or pick up a rental car as I did to extend the trip in other locations. I was very impressed with the logistics provided and the care Dan and Tanya, as well as their office staff, took to ensure that the participant’s needs were met. One person had a late arrival at the airport and one of the staff met that individual at the airport and drove him down to West Yellowstone that evening. Another person was a day late due to weather induced travel problems and Tanya drove up to the airport and back to bring that participant to the group. A few weeks before the trip, a package arrived with a down vest, insulated coffee mug and a folio of information for the trip, and on arrival at the West Yellowstone hotel room I found a re-useable water bottle, a bag of chocolate truffles, some toiletries, and a bottle of wine. Very nice touch. The lunches that Tanya made for us were packaged in re-usable plastic containers which held a hefty sandwich, drink, desert and fruit, yogurt or other item. A variety of chips was also available. The lunches were different every day with exception of the sandwich that was selected for that day on the first night. Out in the park, if anyone wanted to photograph something, they would shout out and the bus would stop and those interested would jump out and do their thing. I think the time spent at the Norris could have been better spent at the Midway Geyser Basin’s Grand Prismatic Spring or have more time at the Upper Geyser Basin near Old Faithful. Because of the travel time involved, it would require reducing the amount of time we spent with some wildlife along the way, but that could have been handled on those occasions that the scene wasn’t changing dynamically enough to warrant staying at that location. That’s my only nit to pick. I can see why many of the participants had traveled with Dan and Tanya in the past, and several had already booked future trips with them. I know I’ll be visiting their website regularly and will likely travel with them again. Very well done article. Your description of the week are accurate and informative. Your photos are fantastic. Thanks for the great Blog, helps me relive the trip. it was a pleasure to meet you. Great photos, Dennis! And thanks for the great description of the trip! I didn’t have the pleaseure to meet you or spend “your” week in Yellowstone. I was there the week before with Steve. It was wonderful to see your pictures, especially those including snow and the bobcat(both of which I misssed). Additionally, your desciption was quite thorough and I appreciate the compilation. Thanks! 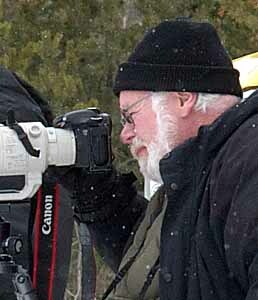 I greatly enjoyed viewing your images from Yellowstone and your other travels. While some of your images are similar to some I took in Yellowstone, you have many that demonstrate your own unique wonderful perpespective. These make me ask, “How did I miss that?” Photography is all about seeing and you see very well. Great images Dennis! Sounds like a wonderful trip! You can enter your email and click on Unsubscribe button to cancel your subscription.